When Hong Kong was ceded to Britain in 1841 the island was described as a rock with hardly a house upon it and on the islands to the south there were a few fishing villages and to the north (Kowloon) there were scattered rice farms. It is a very different matter today! At Hong Kong airport last night the number of people milling around the departure and arrival lounges overwhelmed me; there were literally thousands. After researching passenger movements I now know they were some of the 56 million people who pass through the airport each year. The Hong Kong airport is twelfth on the list with regards passenger movements. Top of the list is Hartsfield-Atlanta International Airport USA with 96 million passengers per years passing through. When I see crowds at airports like tonight I can’t help but ask how long are the resources of the planet going to support the mass movement of people in planes. Not only does air travel on this scale consume non-renewable resources at an alarming rate but also the carbon footprint relating to air travel is staggering. The more I thought about the implications for the planet relative to the mass movement of people the more I realised I knew very little about the green status of air travel. In an attempt to become informed the first question was how much fuel did the aircraft use, ferrying us from Zurich to Hong Kong. Following is what I came up with. For every second of flying time a large international airliner uses about 4 litres of fuel. Depending on flight conditions, over the course of a 10-hour flight it might burn 150,000 litres of fuel, which sounds an incredible amount. Advocates of air travel such as those who build planes say because the plane is carrying 500 people it’s very economical on a per person per kilometre basis. However when you consider that in one day worldwide commercial airliners use 5 million litres of fuel maybe the favourable statistics are not so good. Some research papers state that vapour trails have a high altitude impact in the production of ozone. 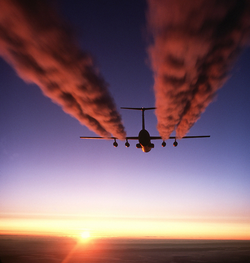 It is estimated that the by-products associated with vapour trails contribute as much to global warming as the CO2 emitted. Knowing this certainly makes me consider whether we should undertake such journeys in the future and, if we do, we may have to look into the purchasing of carbon credits prior to travel. Another thing I have thought about more seriously during this odyssey is how many people there are on the planet. This is pertinent thinking now we are in Hong Kong because people are packed in pretty well here. In 1970 the world population was 3.7 billion and now it’s 7 billion. Population increase means more cars, trucks, roads, houses, high-rise apartments, factories and all these factors add to the exploitation of the planet and maybe its ultimate demise. Some believe that science and technology will come to the fore and save the planet, let’s hope they are right. Another planet saviour might be population reduction as a result of a Zoonotic disease pandemic such as the Swine flu. Many of the modern Zoonotic diseases (diseases transferred from animals to humans) are a result of the world’s populations pushing into wild places where new viruses lurk. At the beginning of our odyssey I would not have thought I would have ventured into climate change, world population matters and Zoonotic diseases. It has been the traffic congestion of Europe and the population intensity of Hong Kong that has set me to thinking more about the future of the planet. The question constantly on my mind is ‘where is the human race heading?’. 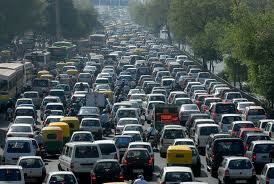 The world’s largest traffic jam in history occurred in 2011 in China. It stretched more than 100 kilometres and lasted eleven days. Some readers of this blog may be climate change sceptics and they are entitled to this opinion. However, when you think about the muck that has been poured into the atmosphere since the start of the industrial revolution it’s worth considering that even if the planet is not warming it would pay to err on the side of caution by changing our ways just in case the research is right. During this odyssey when we have slept under the stars and gazed into the heavens or walked in a pristine rainforest, kayaked in the clear waters where dugong and turtle swim, one cannot help being overwhelmed by the majesty of the planet and the littleness of man. It really is a wonderful place and we all need to make an effort to preserve it. 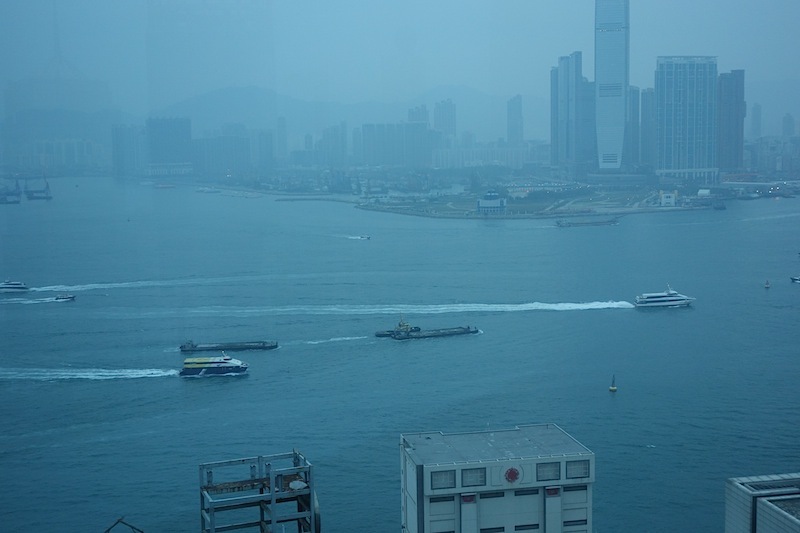 Thick atmospheric view across Victoria Harbour from our Hong Kong hotel. It is well documented that breathing air like this is detrimental to one’s health. Victoria Harbour is a natural landform harbour situated between Hong Kong Island and the Kowloon Peninsula. The harbour’s deep, sheltered waters and strategic location on the South China Sea were instrumental in Hong Kong’s establishment as a British colony and its subsequent development as a trading centre. There are pictures on the web showing clear atmosphere but we didn’t have the pleasure during our stay. The pollution is attributed to coal-fired power stations and traffic, although a significant contribution comes from the tens of thousands of factories in China’s neighbouring manufacturing heartland around the Pearl River Delta. 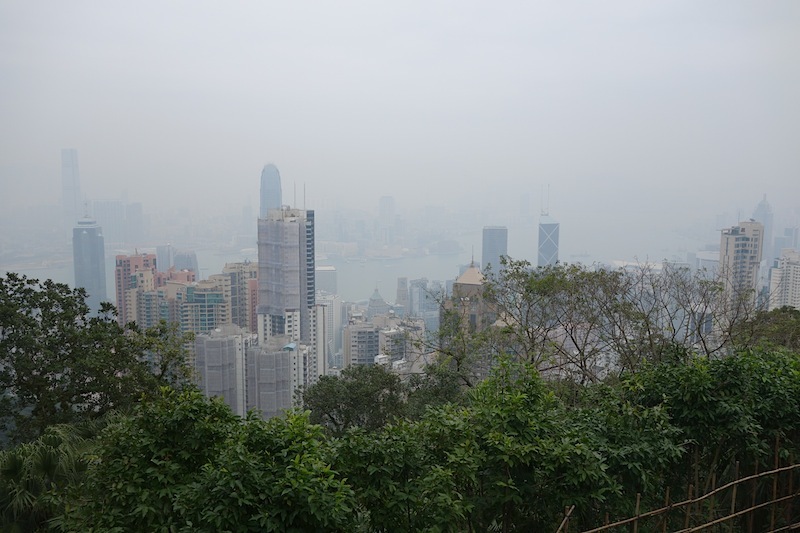 Hong Kong residents are the world’s most pollution-addled population, according to a Gallup survey last year, with 70% reporting high levels of dissatisfaction with the quality of the air they breathe. Bev and I have never visited Hong Kong before so we were looking forward to exploring the city. I have already referred to Hong Kong as intense, not traffic-wise so much; it’s nowhere as congested as other Chinese cities we have been in. Some government bodies want to allow more cars in from the mainland but the people of the city are resisting. A typical Hong Kong day facts relating to Hong Kong population are: population 7 188 342; births today 74; deaths today 70; migration today 47; population growth today 51. The seven plus million people are packed in at around 6700 people per square kilometre, making it one of the most densely populated countries in the world. The following images show the intensity of the population. Packing ‘em in. 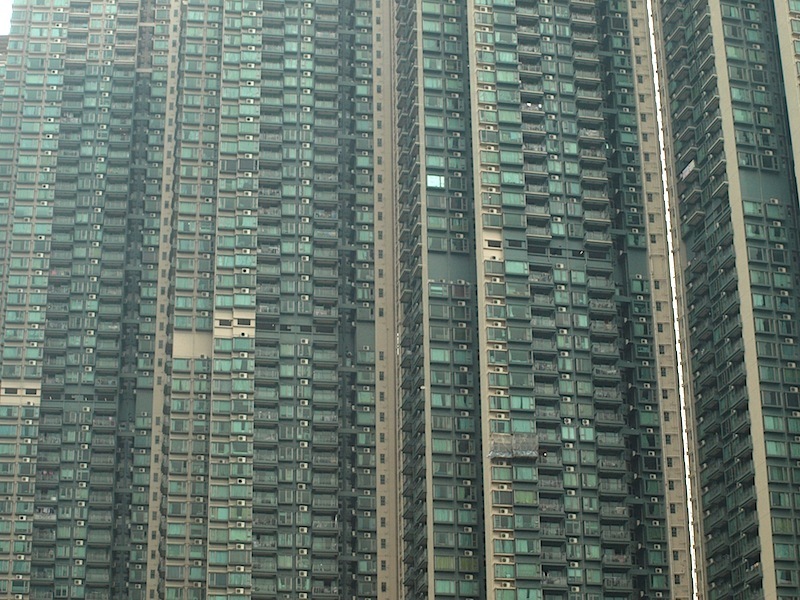 Some people actually live in metal cages within apartments like these. I assume the cages are for security of belongings. No high-rise buildings in 1955 but moves were afoot to get people into high-rise apartments following a devastating fire in 1953. In 1953 an extensive fire swept through a portion of Hong Kong leaving 53,000 homeless. This served as the impetus for a major housing change involving the construction of multi-storey buildings. The structures were designed to house 2,500 people in a fire/flood-proof structure. Every floor in the new buildings included a communal room, washroom and toilet facility. Each person was granted a space of twenty-four square metres (around 5m x 5m). 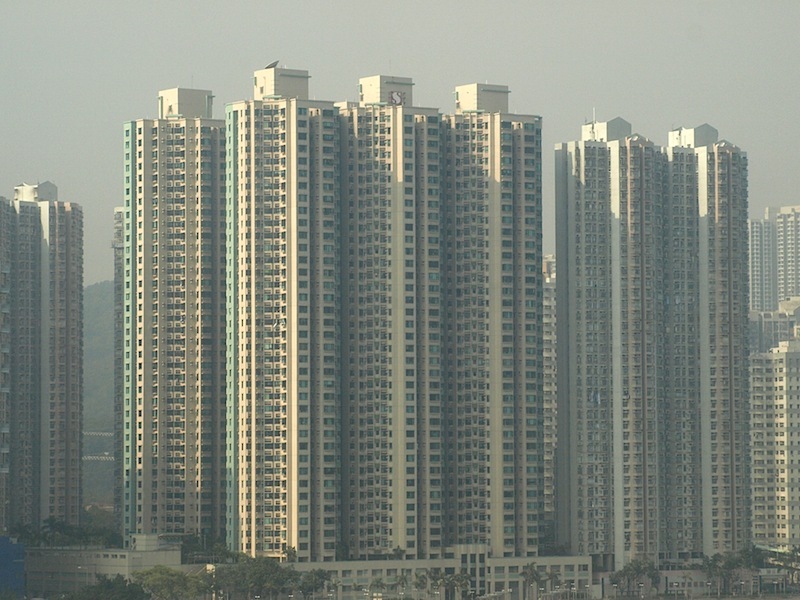 The high-rise buildings became the norm, as skyscrapers have a small area footprint (not carbon footprint) compared to their overall volume. A few of the millions in Hong Kong. 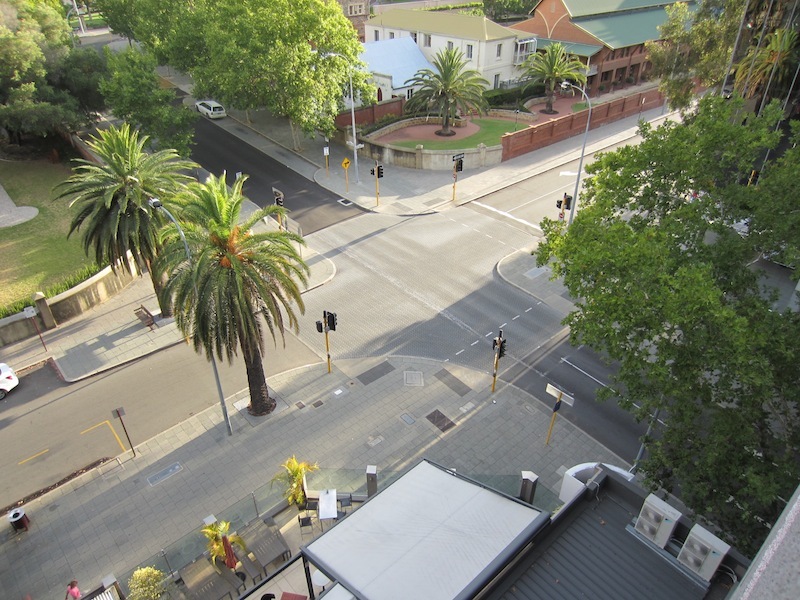 In many places the footpaths are not wide enough and pedestrians spill onto the roadway. View from our hotel window. Living in sardine tins like this is not for us. Portion of an older high-rise. 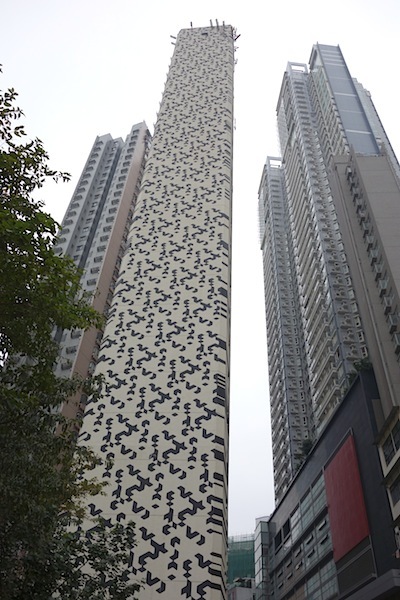 What fascinates me about cities like Hong Kong is that they actually function. For example, it amazes me that vehicles don’t run into each other more often. Another thing is how the services function. Fresh water, food, fuel, electricity, gas, communication and transport lines have to come in then the rubbish and wastes generated have to be taken out. Taking out rubbish is not a problem as there is no shortage of small time recyclers but loo waste is another matter. 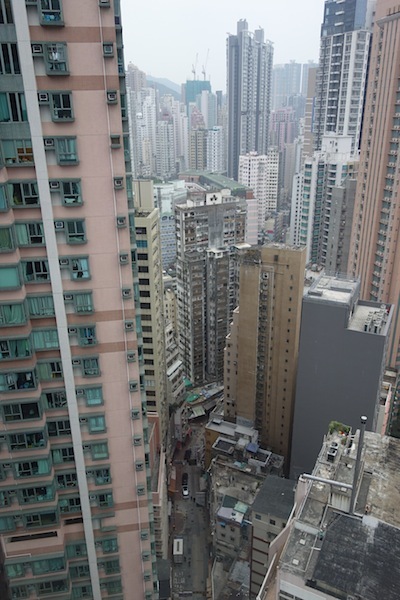 There are 1,660 kilometres of sewage pipelines in Hong Kong, collecting 2.8 million cubic metres of sewage per day. That’s around 1200 Olympic size swimming pools…mind-boggling. Food comes in. 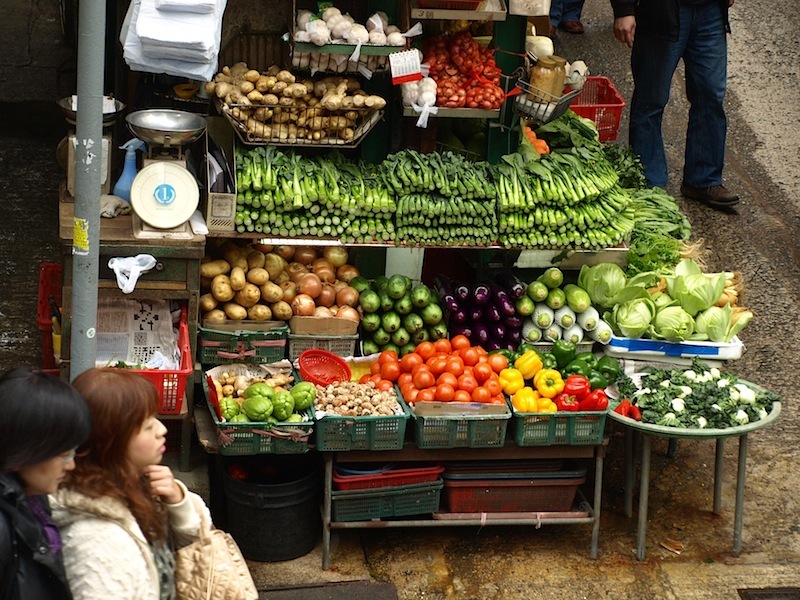 One wonderful aspect about Hong Kong is the food. I do wonder how organic it might be though. One not so wonderful aspect is the wildlife that falls victim to those either seeking an exotic meal or medicinal cure. 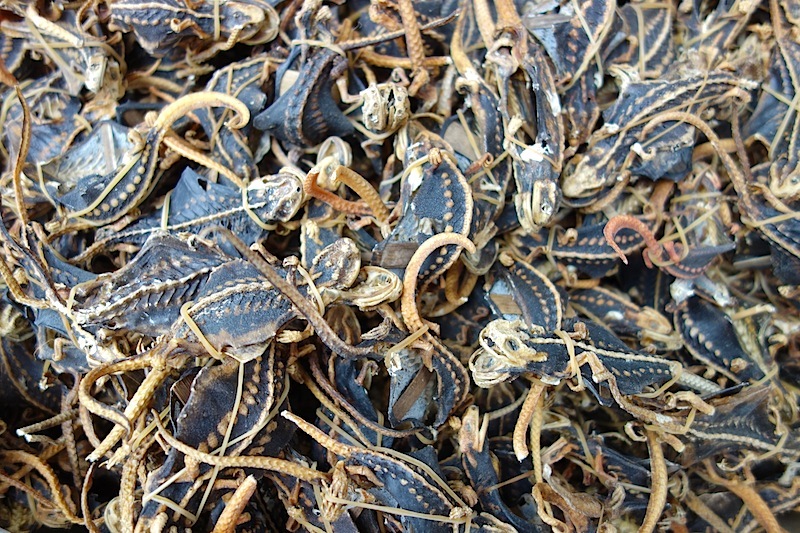 Dried flying lizards on sticks used in traditional medicine. 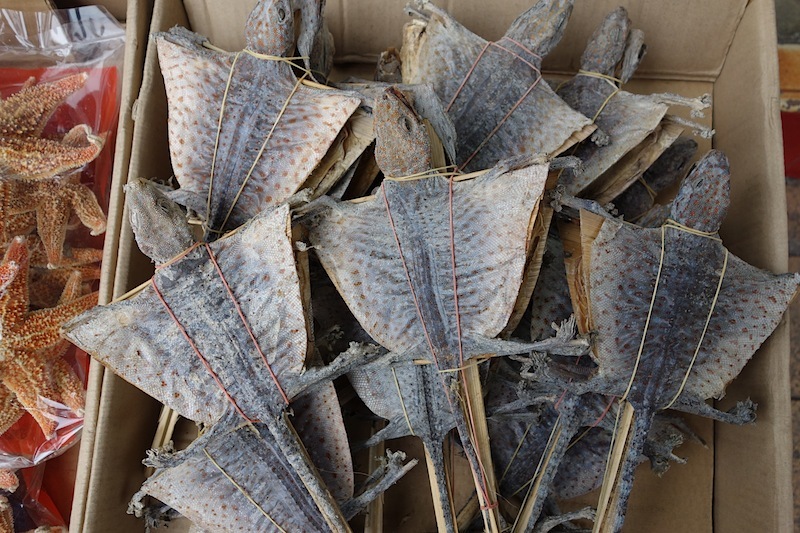 Another box of medicinal lizards. Some of the stuff coming in. All made in China of course. It’s difficult to comprehend the quantities of goods being manufactured in China. A very good DVD (Manufactured Landscapes) shows the scale of the manufacturing sector. One sequence shows a hill and when zoomed in it turns out to be squashed aluminium lids from wine bottles. In another similar sequence the hill turns out to be recycled computer chips. Recently I saw a documentary film on the topic and in an attempt to determine what type of plastic it was a woman lit the plastic pieces with a cigarette lighter and inhaled the smoke, different odours indicated the plastic type. An oldie gathering recyclables to take out. 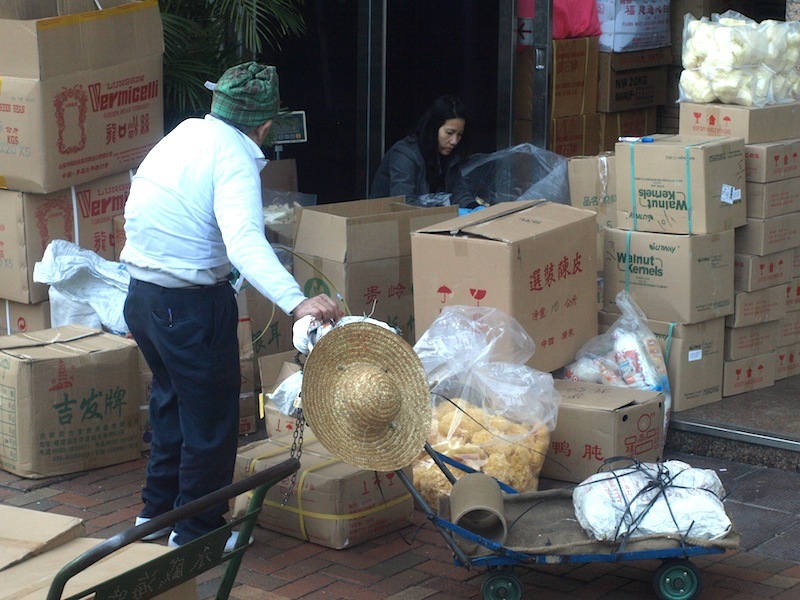 Not all people in Hong Kong are scrounging recyclables on the streets nor living in claustrophobic apartments. There are many luxury apartments. One of the not so claustrophobic apartments is the 2800 square metre (53m x 53m) Presidential Suite in the Ritz-Carlton Hotel. A night in this apartment will set you back A$12 000 per night. 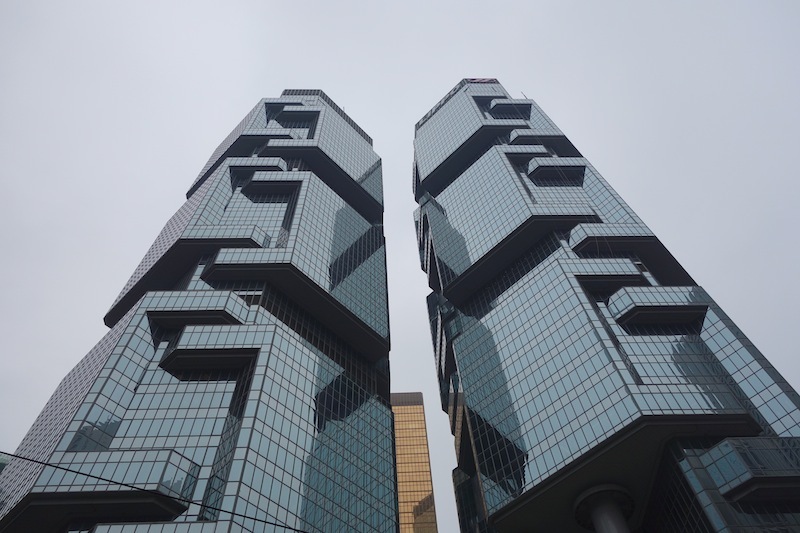 This is not the Ritz-Carlton but one of the many glass cloud-scrapers in Hong Kong. Even though Hong Kong is considered to be up there with the rich countries, not all people are rich. In fact, many live in poverty and are seriously in debt. Hong Kong’s suicide rate is above the world average and many of the suicides are a result of bank debt. Many of the poverty stricken are the young and a proportion of them are referred to as members of the ‘ant tribe’. They are young people who moved from Chinese rural areas into cities where they live in sometimes cramped and dirty conditions. They are hoping one day to obtain a university degree or college certificate that will lead them to a better life. This morning in the dining room of the hotel there were many young waiters and management staff who were most courteous and respectful, indicating to me they were very appreciative of having a job. Maybe they once started out as a member of the ‘ant tribe’. 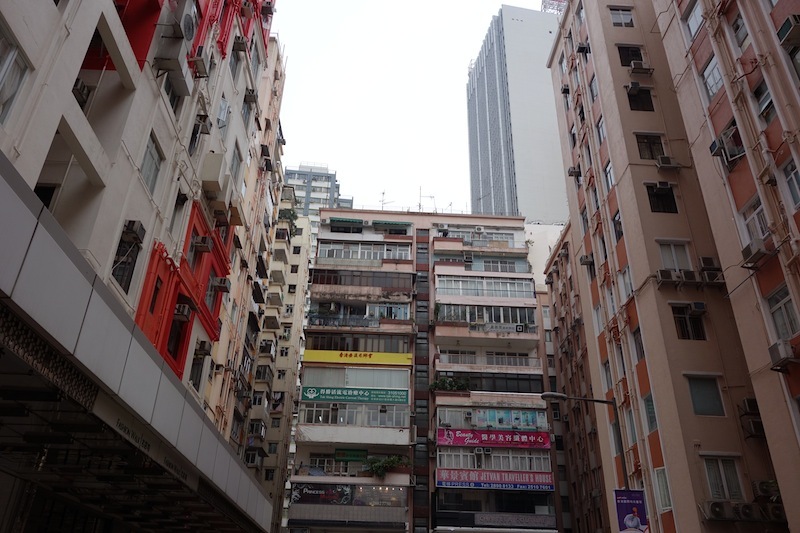 There are many old buildings in Hong Kong but skyscraper apartments and office blocks hem them in so they are hard to find. One we did find was the Hollywood Road Man Mo Temple. Man Man or Man Mo Miu temples (there is more than one in Hong Kong) are temples for the worship Man Cheong and the martial god Mo Tai. The two gods were popularly patronized by scholars and students seeking progress in their study or rankings in the civil examinations during the Ming (1368–1644) and Qing (1644-1912) dynasties. 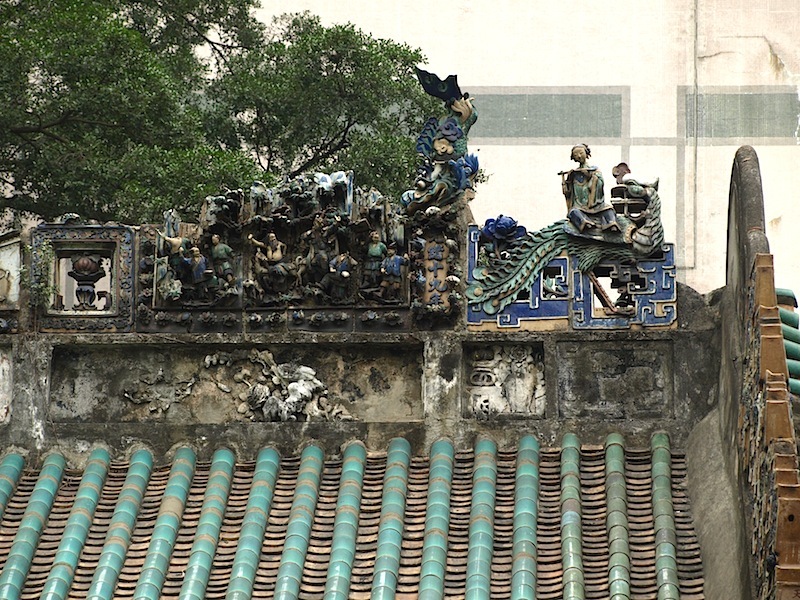 Ornate ridge line on the Hollywood Road Man Mo Temple. 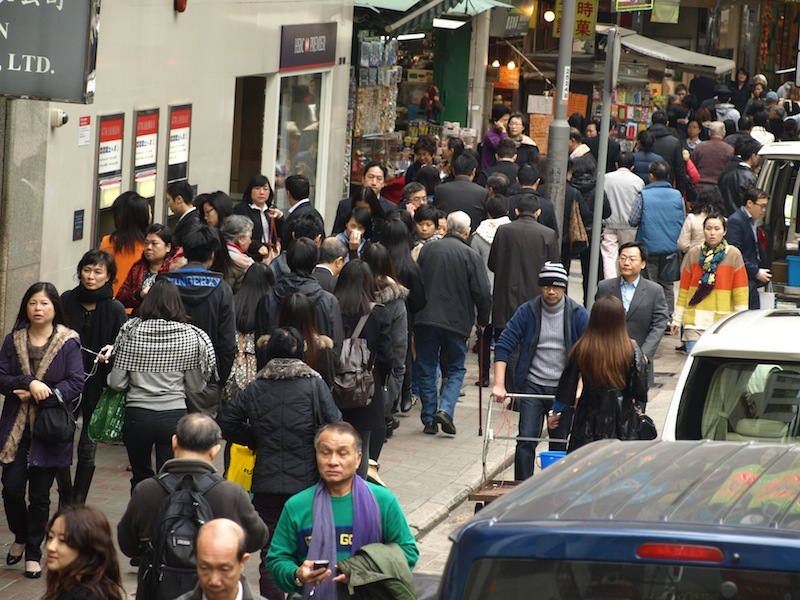 The majority of Hong Kong residents claim no religious affiliation, professing a form of agnosticism or atheism. One poll indicated Hong Kong is the seventh least religious country in the world, with only 22% of the population considering religion an important part of their daily lives. 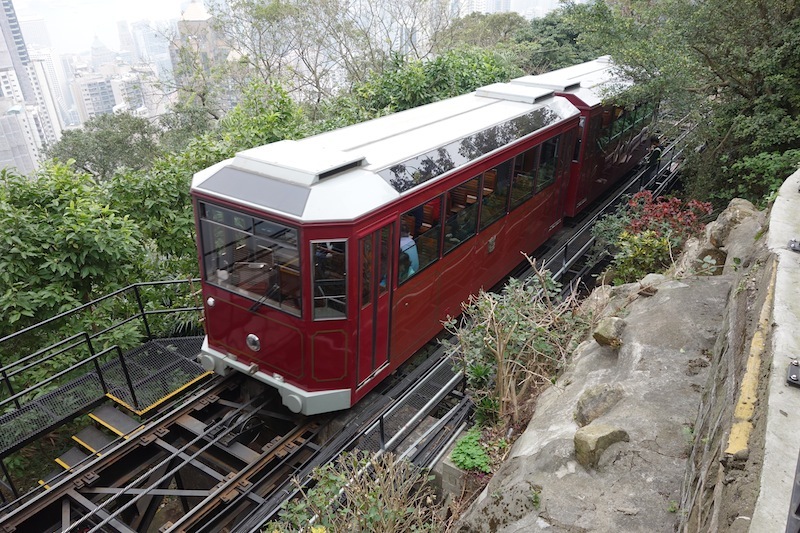 Today we took an open-air bus ride around the city and a ride on the Peak Tram to Victoria Peak which overlooks the city. Being up high didn’t mean we could see the city as it was blanketed in thick smog. 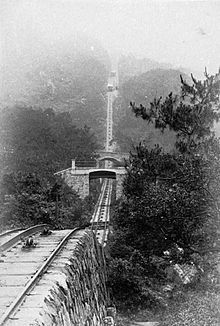 This 1897 image shows clearly how steep the track is up to the peak. Today there are houses and apartments built up to the edge of the line. Trams in Hong Kong have been a form of transport for over 100 years. 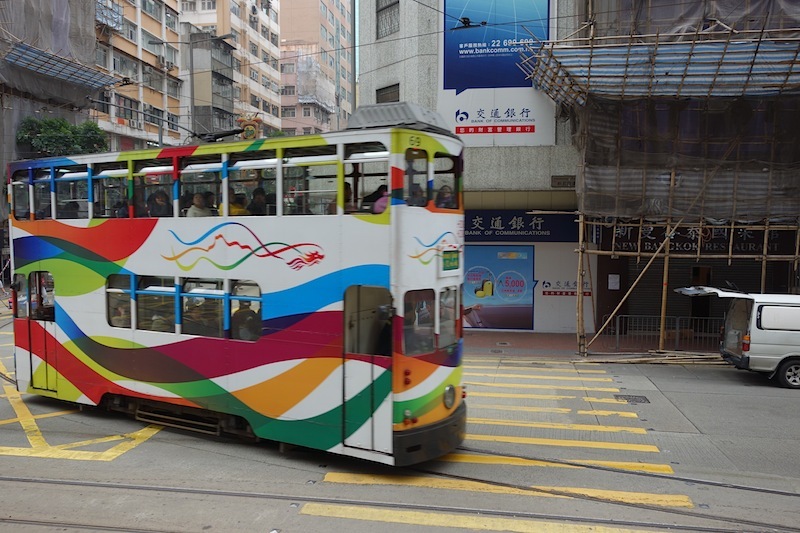 The system is one of the most environmentally friendly ways of travelling in Hong Kong. It is the only exclusively double-decker operated tram system in the world. 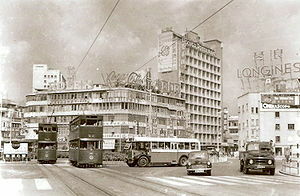 Tram on Connaught Road West in the 1930s. CREDITS #1 US Federal Government public domain photograph via Wikipedia.#2 cdn.benzinga.com Other b &w images copyright free. Early today we went walking around the foreshores of Hong Kong Harbour. 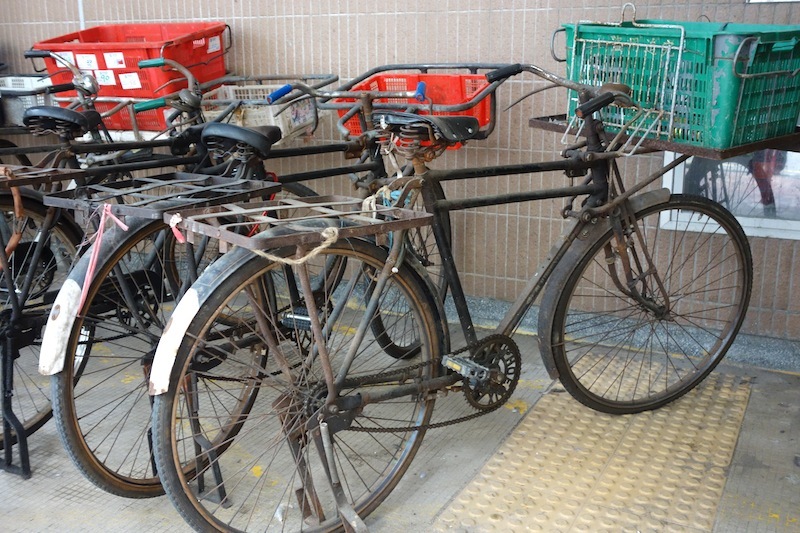 There were the usual ballroom dancers, Tai Chi proponents, some waving the Chinese equivalent to Japanese samurai swords, a mob of disused bikes (very few people in Hong Kong ride bikes these days) and one lonely robin. 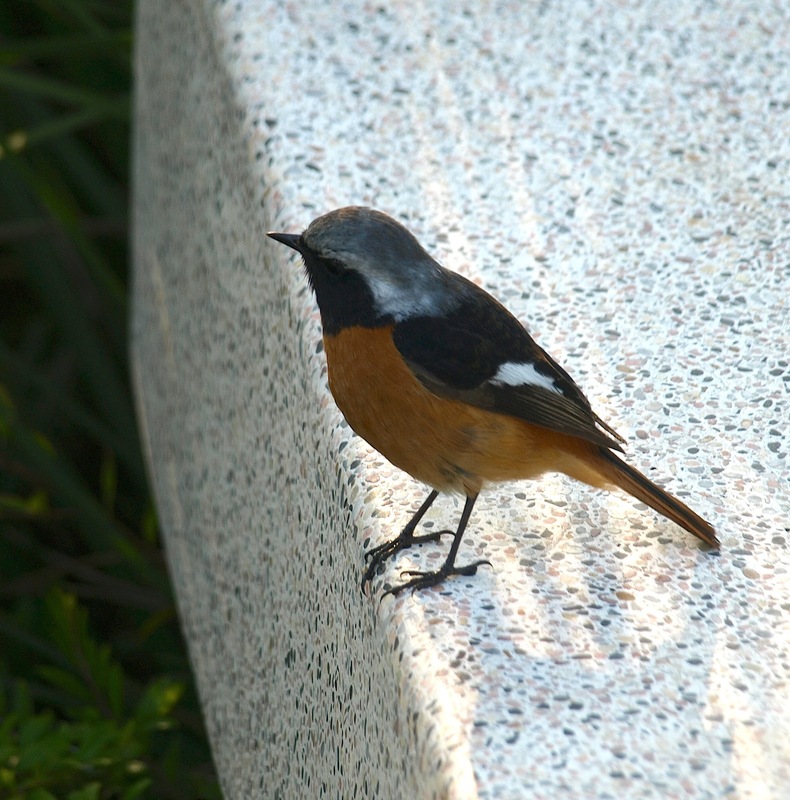 A robin living on the edge in Hong Kong. Mid morning we were back rubbing shoulders with the thousands at Hong Kong airport and by midnight we were in Perth. So ends Leg 10 of our Encountering the Past Odyssey. There is one more leg to go, the drive from Perth to Tamworth NSW. We arrived and booked into our Perth hotel in the dark. The following morning we flung the curtains open and what did we see? A clean, deserted streetscape, which was very refreshing for us after being in crowded and polluted Hong Kong. It was wonderful to be free of over population encumbrances. 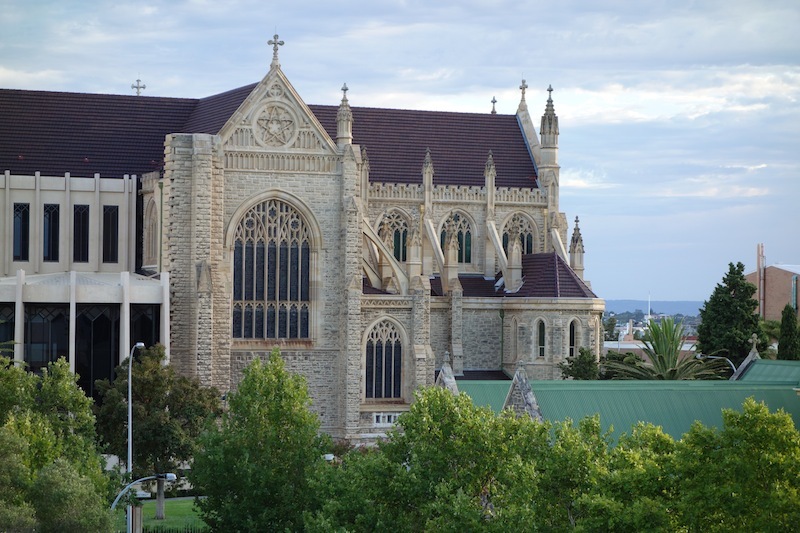 The city of Perth has some wonderful old buildings and because we have been photographing historic and ornate buildings for the past four months we couldn’t help ourselves, we had to ‘click’. It’s easy to recognize Ionic order because of the two scrolls, called volutes, on its capital. The volutes may have been based on nautilus shells or animal horns. Between the volutes is a curved section that is often carved with oval decorations known as egg and dart. 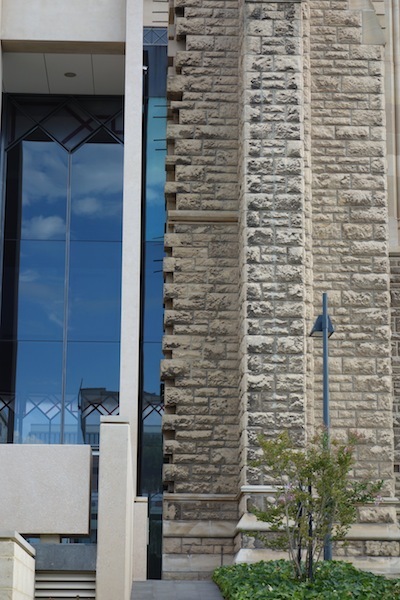 Delicate flying buttresses and the old and the new coming together. Close-up of the old and new. My guess is that the parish ran out of money so only a half a church was built. It’s obvious it was intended to continue with the ashlar theme as they were not squared but left protruding, waiting for the additions to be keyed in. It never happened. What a shame, but as I said, Perth is where the old and new meet. I heard on ABC Radio National (Australia’s equivalent to the BBC) a monk’s chanting performance referred to as ‘Holy Minimalism’. This term could be applied to this building. 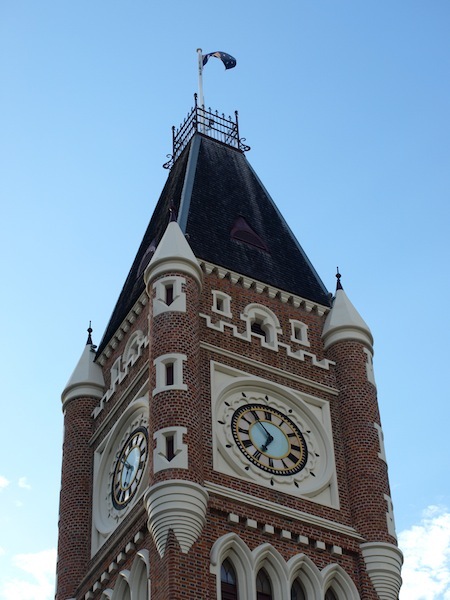 Perth Town Hall spire. Note the broad-arrow loopholes. This style is classified as Victorian Free Gothic. Regular readers of this blog will know that this is the first time we have encountered a Victorian Free Gothic building. I’m over the moon about it because it has many features previously learned about when in Europe…loophole windows, merlons, bartizans, billets and a truncated spire. Absolutely fantastic, and amazingly we found it in Australia. Perth Town Hall. I took the tower photo but for some reason I didn’t take the hall so I rely on JJ Harrison’s image via Wikipedia for the above image. Thanks JJ. 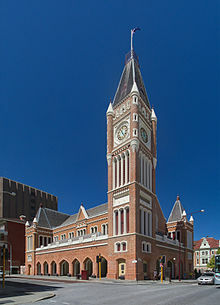 The town hall was built by convicts and free men between 1867 and 1870. Its decorations contain a number of convict motifs, including loophole windows in the shape of a broad- arrow and decorations in the shape of a hangman’s rope. One of the main charateristics of Free Gothic is that architects and designers often chose eclectic styles (mentioned in the blog relative to Milan Railway Station) and merged them into the one building. This sometimes looked dramatic and spectacular, and at times it looked rather ‘over the top’. In many cases, buildings had asymmetrical towers and layers of ornamental brickwork. There was also much use made of newer building materials such as tiles, large glass panes, concrete and purpose-made bricks. 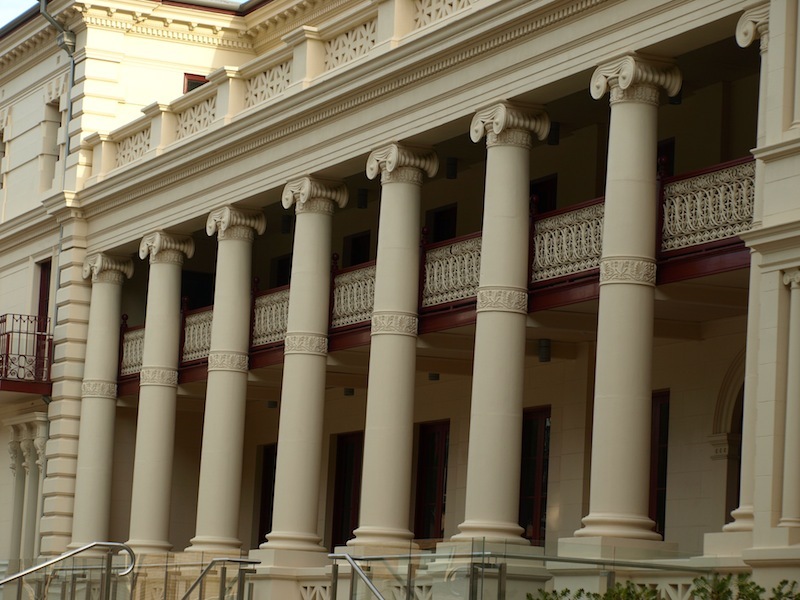 I don’t think the Perth Town Hall is ‘over the top’, the design and the balance of the mediums is just right. For those interested in this topic go to the Nation RE web page and click on ‘View Samples’. You will be amazed at not only ‘over the top’ architecture but jewellery, clothes, ornaments and art as well. Over the next few days we will prepare for the long drive from Perth to Tamworth. When we leave will depend on the weather. I’m watching the weather map and as soon as there is a cold front coming off the Indian Ocean we will be riding it home. I hope you stay with us.